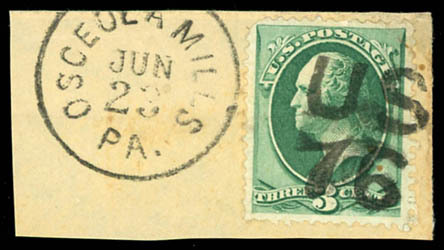 1873, 3¢ green, tied on piece by fancy "US 76" Centennial cancel and matching Osceola Mills, Pa. town alongside, stamp with small flaws, an Extremely Fine strike; with 2014 P.F. certificate. Scott No. 158 Estimate $150 - 200. 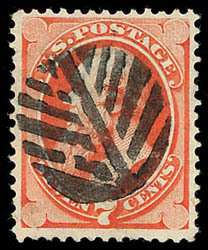 1873, 7¢ orange vermilion, ful strike NYFM cancel, well centered amid oversized margins, rich bright color, a Very Fine jumbo, ex-Kirke; with 1992, 2003 and 2011 P.F. certificates. 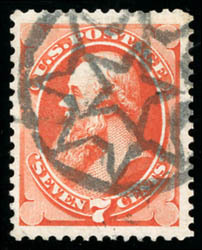 1873, 7¢ orange vermilion, choice strike fancy cancel, Very Fine. 1873, 10¢ brown, full o.g., exceptional centering within beautifully balanced margins, rich vibrant color and sharp proof-like impression, Extremely Fine to Superb; with 2017 P.S.E. 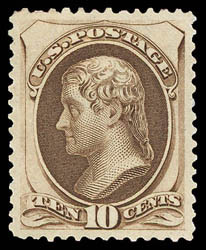 Graded certificate (XF-Sup 95, SMQ $4,500). AN EXTRAORDINARY MINT GEM EXAMPLE OF THE 10¢ CONTINENTAL BANKNOTE ISSUE. 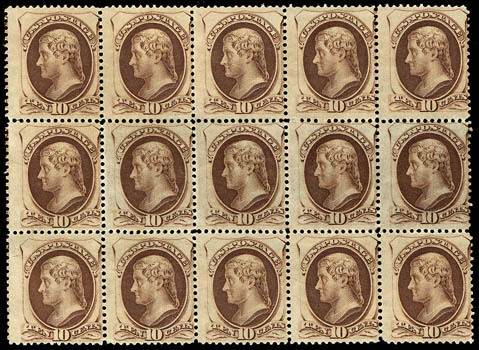 1873, 10¢ brown, block of 15, o.g., lightly hinged, fresh with rich bold color, about Fine, an attractive and rare showpiece, Scott catalog for two blocks, three pairs and a single. 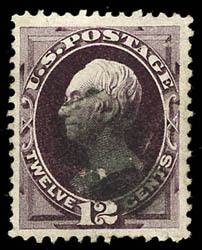 1873, 12¢ blackish violet, large margins, Very Fine. 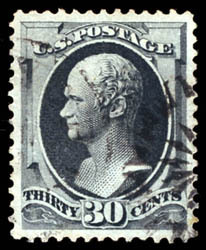 1873, 30¢ gray black, showing plate flaw on shoulder, N.Y.F.M. cancel, precision centering within large beautifully balanced margins, rich vivid color, Extremely Fine and choice; with 2001 P.S.E. and 2015 P.F. certificates. 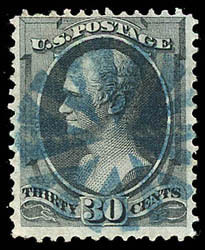 1873, 30¢ gray black, beautiful "on the nose" blue ornate fancy cancel, Fine, gorgeous. 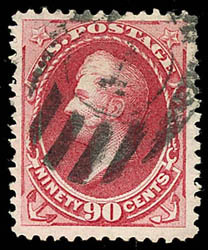 1873, 90¢ rose carmine, fancy "H" cancel, encompassed by huge evenly balanced margins, bright color, reperfed at left, Extremely Fine jumbo appearance, a mammoth gem appearing stamp. 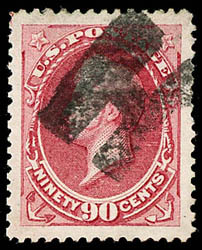 1873, 90¢ rose carmine, fresh & Very Fine.